It takes just one day for an email to be a lost cause. Drawing on data from over 500,000 sales emails sent by Yesware users in Q1 2014, we found that if your email is ever going to be opened, 91 percent of the time it’s opened within a day after you sent it. Furthermore, 90% of emails that received replies were replied to within one day after they were opened. 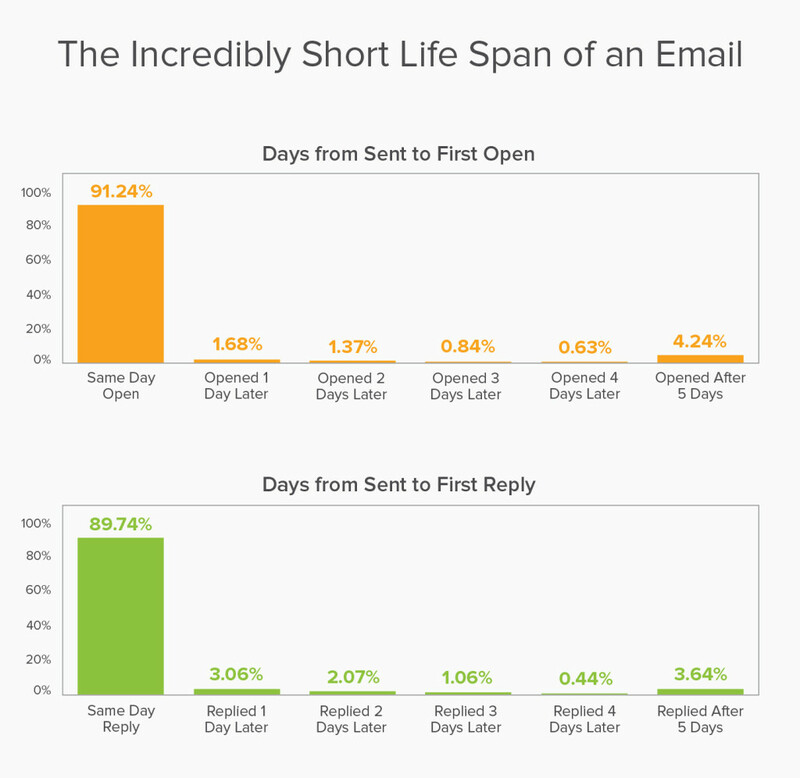 During that first day, over half of opened emails were replied to within three hours. Bonus: Click here to find out if they’re opening your follow-emails emails. What it means: It pays to be proactive. After you send a tracked email and can see that it’s opened, the countdown is on. Any replies will most likely occur that day, so don’t sit around waiting for a reply if you haven’t received a response within a day or two. Send a follow up email. Deciding when and how to follow-up with people who don’t respond to your initial email can be tricky — especially when you can see that they’ve opened it. It’s not easy to strike the balance between adding value and being annoying. 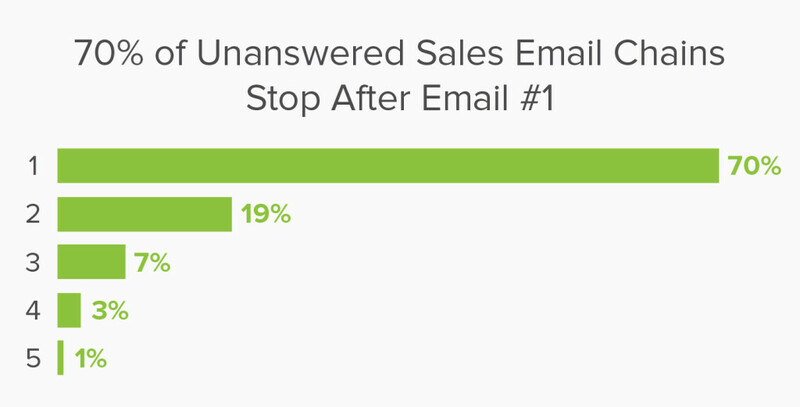 So it makes sense that the majority of sales folk may choose not to follow-up at all. We ran the numbers and found that 70% of unanswered sales email chains stopped after the first attempt. Only 19% went on to email a second time. According to Yesware’s data, if you don’t receive a reply to your first email, you have a 21% chance of getting a reply to the second one. Still no reply? Take heart and keep sending: There’s still a 25% chance that you will eventually hear back from the recipient. What this chart illustrates is that by continuing to send more emails, you create more opportunities for your recipient to reply. It is a study in scale. Greater volume of emails should correlate to greater total response, and the chart above shows this to be true. Bottom line: It pays to follow-up. Get follow-up emails off your plate with an automatic sender that plugs right into Gmail and Outlook. Most emails are toast after 24 hours. If you haven’t heard back by then, reach out again. Follow-up emails are worth the effort. 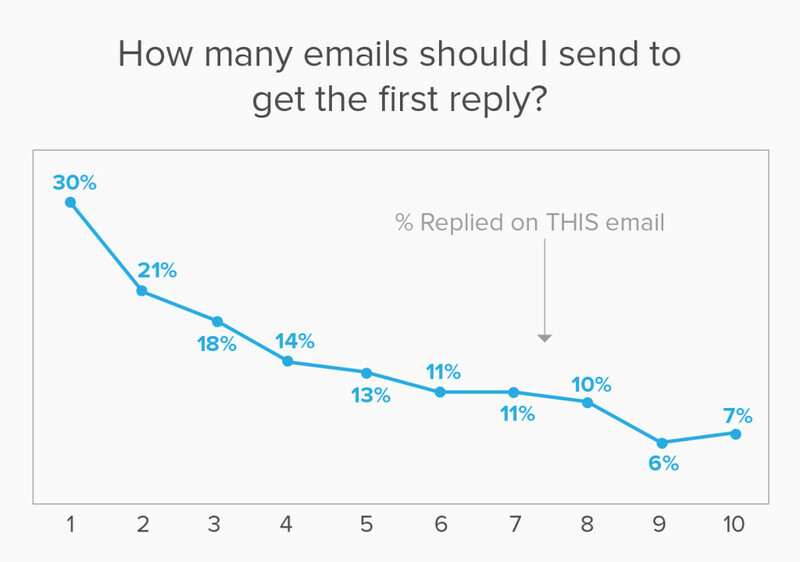 You have a 21% chance of getting a reply to your second email if the first goes unanswered. And as always, be sure to keep experimenting, iterating, and improving. Here’s some of our favorite follow-up email resources to help you get started. New Data: The Most Common Subject Lines Actually Have Below Average Open Rates.